Barbara Grant, MA A.B.S. is the Founder and Principal Consultant for Barbara Grant Consulting Group. She has been actively involved in leadership roles and building and developing communities and organizations in Washington State since 1986. Barbara’s experience reflects the diversity of the Puget Sound area, as her work has spanned the private, public, and nonprofit sectors. Her current work includes varied clients such as international NGOs, small businesses, local nonprofits, and public institutions, and is focused on comprehensive organizational and leadership development, facilitation, strategy, board and leadership team functioning, and evaluation. She has worked in Africa, Asia, and Latin America and is fluent in Spanish. 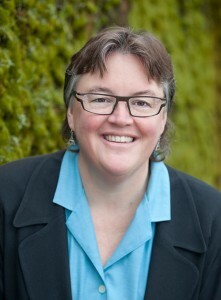 Barbara excels at facilitating cooperative intersections among multiple stakeholders in support of organizations’ unique missions, as reflected in her ongoing work with multiple membership associations and their affiliates, and various public-private partnerships. Barbara understands, facilitates, and trains effective conflict management and specializes in helping organizations capitalize on their own resources and work through conflict in a productive way. Her systemic approach to individual and organizational leadership and capacity development drives decision making and promotes sustainability. Barbara has a BA in International Relations from the University of Notre Dame, and a Masters in Organizational Leadership. Prior to founding her Consulting Group, she spent a decade managing domestic and international business issues for the Microsoft Corporation. In the 1980s, Barbara worked for the Archdiocese of Seattle, building up a statewide program of community-based awareness, counseling and advocacy for young people in Washington state detention centers. During her tenure at Microsoft, she gained experience with strategic business planning and senior management development for several departments, and served as Microsoft’s Director for the worldwide Management and Employee Development organizations. Barbara also supervised customer support and product development businesses, managed employees in several countries, and traveled and negotiated business partnerships. She was a founder and/or Board member of several employee diversity groups. Barbara has been a regular speaker and presenter for local and international conferences. Her sessions are consistently highly-rated. She has been on the faculty for the University of Washington’s Organizational Communication certificate program, and the City University business program, and is currently a faculty member at Seattle University teaching leadership and management in the MFA program. Barbara’s clients appreciate that she has faced many of the same challenges they face: having accountability for today’s bottom line results while attempting to anticipate and capitalize on tomorrows emerging opportunities to support excellent outcomes for clients served. She is a skilled strategic advisor and leadership coach and dynamic facilitator. Her depth of experience in organizational development continues to be an asset to organizational leaders, intersecting teams, and local and global organizations. She can be reached at barbara@bgrantgroup.com. 3418 S. Mt. Baker Blvd.